It's been pretty quiet around here lately. Not because I want it to be; life has just been kind of crazy. Family stuff is going on and my work schedule changed. So, there hasn't been a lot of time for blogging. Or rather, the time I would normally have for blogging is getting eaten up by other things. I want to be blogging and I feel guilty about not posting. Mainly because I've been reading some terrific books and I want to talk about them, sing their praises. I miss posting reviews and reading reviews and posting comments and just discussing books. Every day I think, "Today's the day, I'm going to sit and finish that review." But, more often than not, something else takes precedence. So, rather than feel guilty about not posting, I'm going to take a break, a smallish one, through the end of the year. Once the holidays are over, I'm hoping (and praying) that things calm down. I'll be back the first week of January (January 3rd to be exact) with renewed enthusiasm and some reviews and book discussions. Enjoy your break! I always think breaks are healthy for the blog. 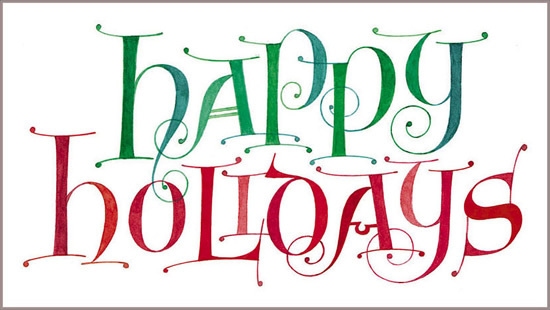 Have a really nice holiday break! Sometimes it is good to just take a breather and get caught up on life. I will probably do the same in January. 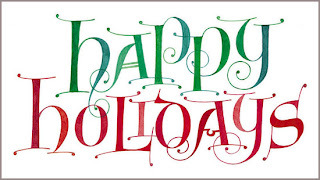 Hope you have a great break and enjoy the holidays! I hope your Holidays are wonderful. Life has been putting me in a tizzy too!